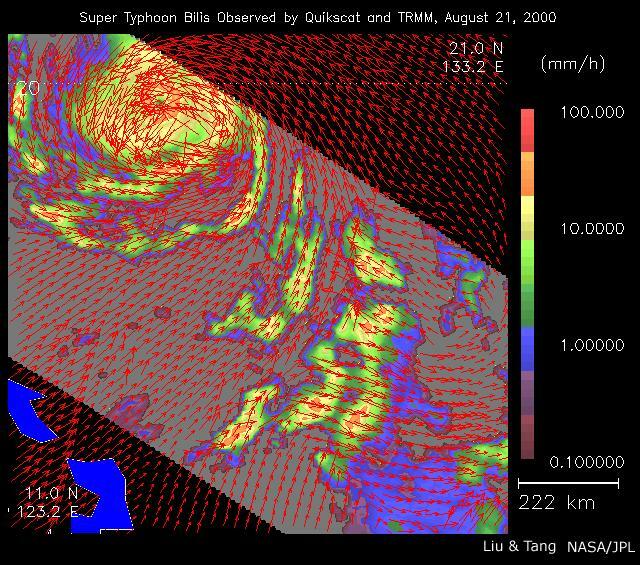 As super Typhoon Bilis, equal in strength to a category 5 hurricane, bore down on Taiwan, these images from August 21, 2000, show the massive storm's most devastating components: rain and wind. Conventional satellite data provide imagery of the clouds at the top of a storm. These images, however, were created by combining data from two NASA instruments capable of looking through a storm's clouds and seeing what is going on at the surface. These two instruments passed over the same location about one hour apart. The images show the surface winds, measured by SeaWinds on QuikScat's radar scatterometer, as red arrows. 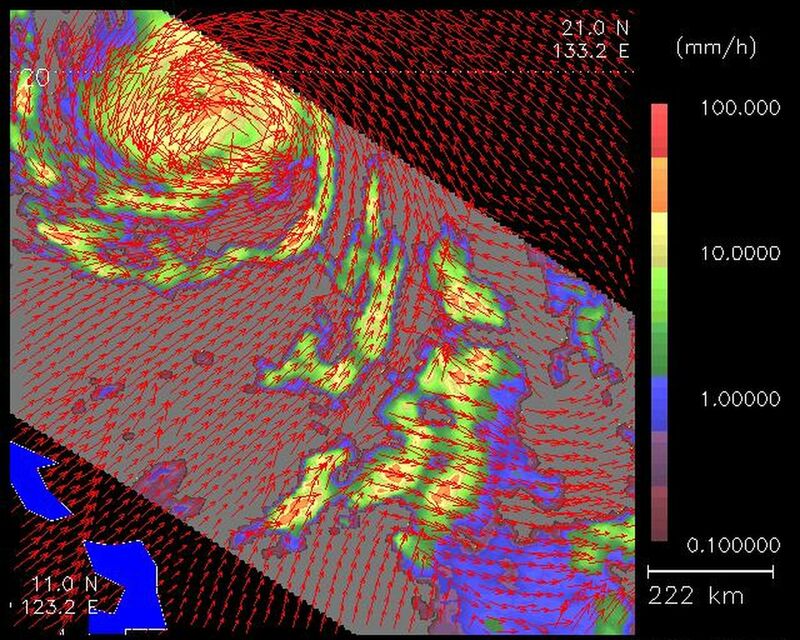 The wind data are superimposed on rainfall measurements made by the microwave imager on the Tropical Rain Measuring Mission (TRMM). The scale on the right shows the amount of rainfall in millimeters per hour. 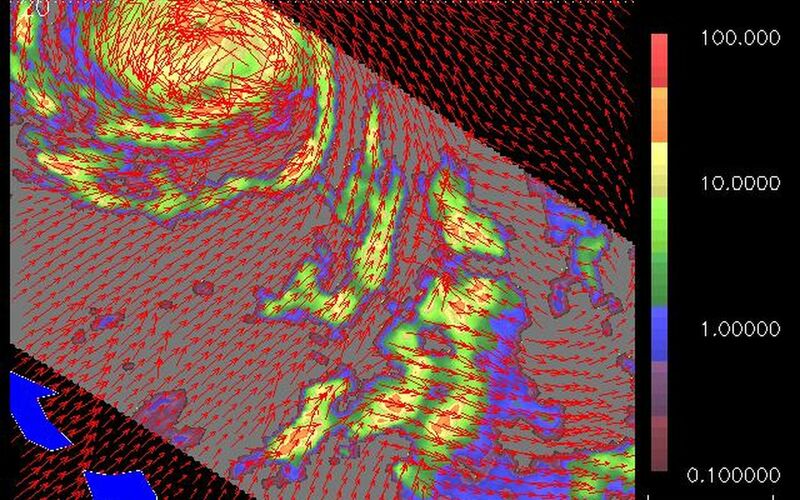 QuikSCAT, launched in June 1999, and TRMM, launched 18 months earlier, provide the opportunity to observe both wind and rain before landfall. The SeaWinds on QuikScat project is managed for NASA's Earth Science Enterprise by NASA's Jet Propulsion Laboratory, Pasadena, Calif. TRMM is a joint US/Japanese mission managed by NASA's Goddard Space Flight Center, Greenbelt, MD.